The Youth Justice Leadership Institute launched in 2011. Each year, a small cohort of fellows is selected through a competitive application process from among leaders all over the country. See below to learn more about the stellar cohort we were fortunate to assemble in 2014. Chaz Arnett works in the Juvenile Court Division of Maryland’s Office of the Public Defender (OPD). At OPD, he represents juveniles in Baltimore City in a wide range of delinquency matters and works on a number of boards and committees to push for system-wide changes for the betterment of youth.Chaz graduated from Morehouse College in 2003 with a degree in Sociology and Criminal Justice. He earned his juris doctorate degree from Harvard Law School in 2006. While at Harvard, he represented indigent clients in criminal cases at Roxbury District Court in Boston, Massachusetts as a student attorney with the Criminal Justice Institute.In 2009 he accepted the Satter Legal Research Fellowship from Harvard Law School’s Human Rights Program. During the fellowship year he worked with the International Center for Transitional Justice's (ICTJ) Zimbabwe Unit and spent time in both South Africa and Zimbabwe. Upon his return to the U.S., Chaz worked in Washington, D.C. at Advancement Project as a staff attorney in the “Ending the Schoolhouse to Jailhouse Track” program. Chaz, assured that the criminal justice movement is the new civil rights movement, has dedicated his career to fighting for the protection of constitutional rights and for the elevation of basic human rights within our criminal justice system. Read our interview with Chaz here. Anthony DiMartino is an administrative analyst for the Development Services Department for the City of Long Beach. Anthony began an internship with the City of Long Beach in 2012 while completing his Master of Social Welfare at the University of California, Los Angeles (UCLA). He has engaged in several different projects ranging from GIS mapping, data analysis, and evidence-based practice research to help write the City of Long Beach’s Violence Prevention Plan. He currently serves as a grant writer for the Development Services Department and works on grants and program development around violence prevention, gang intervention, and youth programming. Anthony also has three years of experience managing a mentoring program for high school youth and has volunteered with the juvenile justice system for two years. He continues to serve as a mentor for several youth in the Los Angeles area. Anthony holds a BA in Psychology from the University of Redlands and a M.S.W. from UCLA. Ekundayo Igeleke is an inclusion architect who has experience with community activism, public education, the non-profit sector, and higher education for over six years. 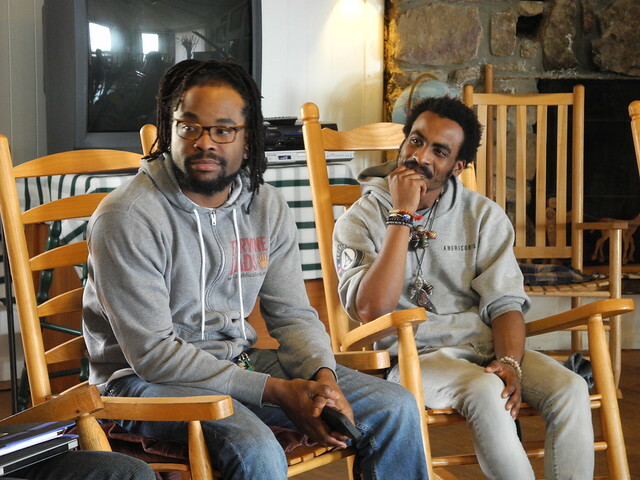 Currently, Ekundayo Igeleke is an Organizer for the Children’s Defense Fund (CDF), New Abolitionist Association where he focuses on dismantling the cradle to prison pipeline, An Organizer for the International People's Democratic Uhuru Movement and wears many other hats that contribute to the liberation and uplift of oppressed youth. He is also the Graduate Studies Coordinator for the African American and African Studies Department. In 2011, Ekundayo was selected as an apprentice for Public Allies where he worked with The Urban League of Greater Cincinnati as the Parent Engagement Specialist. Once the program was complete, he worked for the University of Cincinnati as the Diversity Coordinator for Recruitment and Retention, operated a CDF Freedom School’s program as the Site Coordinator, and was independently contracted to facilitate diversity and inclusion workshops for youth and young adults. He also worked for the Boys and Girls Club for three years, tutoring and mentoring youth. Ekundayo has a BA degree in Africana Studies and Sociology and will be pursing his MA degree in Cultural Foundations of Education at The Ohio State University, starting Fall 2014. Read our interview with Ekundayo here. Maheen Kaleem | Washington, D.C.
Maheen received her J.D. from Georgetown University Law Center in May of 2013 and her undergraduate degree in International Politics and Human Rights from Georgetown University's Edmund A. Walsh School of Foreign Service. She has worked on a number of issues related to women's rights and racial justice, with a particular emphasis on the rights of incarcerated women and children, and a special focus on the needs of girls in the juvenile justice system. Maheen has been engaged in direct service with youth and families involved in the juvenile and child welfare systems in California, Washington, D.C., and Pennsylvania for the past ten years. Prior to law school, she spent three years as a crisis responder and court advocate for commercially sexually exploited children in Oakland, California. As a Stoneleigh Emerging Leader Fellow at the American Civil Liberties Union of Pennsylvania, Maheen spent a year developing an innovative model to address the issuance of criminal citations to students for minor behavior problems in Pennsylvania schools. She is honored and humbled to join the 2014 cohort of fellows. Read our interview with Maheen here! Donna A. McHenry was born and raised in Phoenix, Arizona. She graduated from Arizona State University, earning a Bachelor’s Degree in Communication and achieved her Master’s Degree in Organizational Management from the University of Phoenix. Currently Donna serves as the Crime Prevention Specialist for the Maricopa County Justice System Planning and Information Department. She serves on a number of committees and commissions, which include: Maricopa County WIA Youth Council, City of Phoenix Women’s Commission, Children’s Action Alliance Juvenile Justice Advisory Committee, One Community’s Multicultural Advisory Board, and Chairs the Maricopa County Regional School District’s Advisory Board. She also had the honor to have served on: Phoenix 2010 Census Complete Count Minority Outreach Subcommittee, Central City Village Planning Committee, AmeriCorps, and is a proud member of Delta Sigma Theta, Incorporated. Read our interview with Donna here! Christy Sampson-Kelly is a tireless advocate for a particularly vulnerable group of young people, those with special needs incarcerated within long-term, secure, juvenile facilities. Currently serving as the Director of Practitioner Support for the Center for Educational Excellence in Alternative Settings (CEEAS), Christy provides direct coaching to schools inside locked facilities in the areas of curriculum, instruction, assessment, and student engagement, with a keen focus on helping schools improve how they teach and support students with special needs. Before joining CEEAS, she worked first as a general and special education teacher and then as a school-wide special education coordinator. Christy earned her BS in elementary education from the University of Maryland, her MA in special education from San Diego State University, and her PhD in special education, also from the University of Maryland. Read our interview with Christy here! Theo Shaw is a Community Advocate at the Southern Poverty Law Center. Theo graduated from the University of Louisiana at Monroe in 2012, where he received a BA in Political Science. Planning on going to law school in the future, Theo has already acquired valuable experience in his area of interest, including one with the Innocence Project, a national nonprofit organization that works to free wrongfully convicted prisoners. Now as an Advocate for the nonprofit civil rights organization – the Southern Poverty Law Center – Theo’s mission includes efforts to alter the course for at-risk youth, a necessary objective to keep students in school, out of correctional facilities, therefore permitting them to make positive contributions to their communities. Elijah Wheeler currently serves as the Disproportionate Minority Contact Reduction Coordinator for Montgomery County, Maryland, a suburb of Washington D.C. For the past four years as a DMC Reduction Coordinator, he has been tasked with addressing and working alongside system partners to reduce the disparities faced within the juvenile justice system by youth of color. Majority of his past work experience was spent teaching and working with Special Education students in an Alternative school setting in his hometown of Cleveland, Ohio. In his spare time, he plays Judo to “relax” his mind and is a proud husband and father. Darnell Thigpen Williams, Associate Director of Professional Development at the Collaborative for Educational Services for the Massachusetts Department of Youth Services (DYS) Education Contract brings over 20 years of urban education experience in a variety of settings: classroom teacher, staff developer, curriculum specialist, program developer, and adjunct professor. His interests and passion have focused on transforming educational systems and practices within urban school districts, alternative school contexts, and juvenile justice educational settings. He has designed, implemented, and led professional development efforts in DYS and Special Education in Institutional Settings (SEIS). He also facilitated specialized trainings on key DYS education projects including, but not limited to, the learning team model, new teacher induction, teacher and staff development, and supervision and training of instructional coaches. Prior to joining the Collaborative for Educational Services, Darnell led the Education Quality Assurance (EQA) Initiative in DYS at Commonwealth Corporation for four years. Darnell is a graduate of Harvard Graduate School of Education (HGSE) and Boston University (BU). Kathy Wright is the developer of NJPC’s Professional Parent Advocacy Training and Engaging Parents & Family Members Training and Curricula – both approved by NJ Department of Children & Families; OJJDP Families Uplifted Prevention Initiative for at-risk youth in New Jersey. Her accomplishments include the National Technical Assistance Center for Children’s Mental Health at Georgetown University providing technical assistance services in the Transformation Facilitation (TF) process to state level children’s mental health directors and serving as a TF Management Team Member; SAMHSA Statewide Family Network Technical Assistance Center providing Technical Assistance to Statewide Family Networks throughout the country; Consultant Pool for Georgetown University National Center for Cultural Competence; Director of Adolescent Services & Child Welfare/DYFS Liaison for SOS, a 95-bed shelter for homeless women and children; Director of Education for Skyland Community Development, Inc., a community project serving the educational and employment needs of the Ramapo Indian population in NJ; Kathy has also served as Adjunct Professor at numerous universities throughout NJ and continues to serve as grant reviewer for US Department of Education, US Department of Justice, US Department of Health & Human Services, and NJ Department of Children and Families. She completed her undergraduate and graduate studies in the areas of Psychology and English at Drew University. Read our interview with Kathy here!